RB; Edwin Baker #4. The sophomore from Highland Park, Michigan has well played in his first two games this year rushing for 117 yards against Western Michigan and 183 yards against Florida Atlantic. He has already topped his TD total from a year ago with 3 TD's. Baker only rushed for a total of 427 yards last year on 85 carries with only 1 TD. It's hard to tell how well Baker actually is because he has yet to face a marginal run defense has FAU has let up 570 rushing yards in 2 games and Western Michigan has only played Nicholls State other than MSU. Look for MSU to give Baker his carries this weekend has he is the key for them this weekend. LB; Greg Jones #53. He was the 2009 Big Ten defensive player of the year and by no surprise 2010 pre season Big Ten defensive player of the year. Not to mention he was also a 2009 consensus first team All-American. Jones recorded a total of 153 tackles last year, 66 solo along with 9 sacks. This year he has 20 tackles and already 2 forced fumbles. 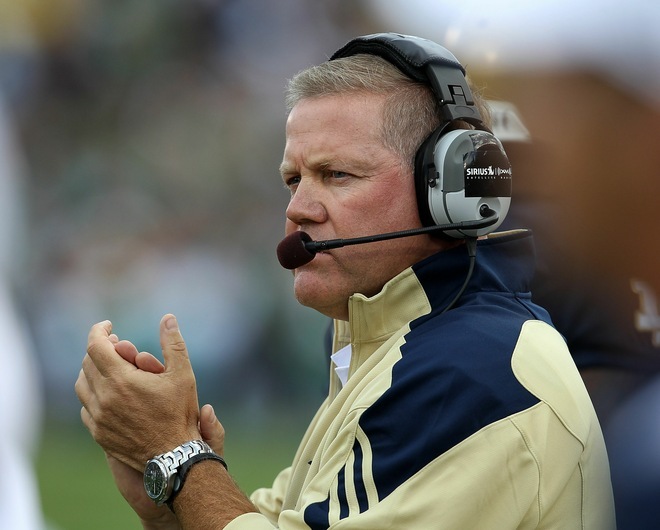 Brian Kelly got another solid commitment today, solidifying the depth at quarterback. Andrew Hendrix recommitted to Notre Dame today, choosing the Irish over the Gators. Hendrix originally committed to Weis and his staff all the way back in june. Here's an article from back in june from Truegipper. Hendrix is now the second QB in the class high school class of 2010. Tommy Rees from Lake Forest, Illinois is the other QB who enrolled early so he can practice with the team in the spring. To add to the depth at quarterback Nate Montana transferred back from Pasedena College. Some even thought that WR John Goodman would be moved back to QB (use to play QB in high school). Now with the Irish gaining Montana and Hendrix this week, Goodman will stay at wideout. I would like to see Kelly bring in a more mobile QB in the years to come. I liked the play of Cincy QB Zach Collaros last year, he rushed for 325 yard in 5 games when starting QB Tony Pike was hurt. It wasn't like ColIaros had blazing speed, he just had good speed for a QB. am not questioning at all what Brian Kelly is doing, I am just saying that I think a mobile QB would only be for the best. Plus it would be pretty awesome to watch.